Operation Turkey is now the big gobble, Delivering Thanksgiving! In 2017, we operated under the national brand as Operation Turkey and partnered with Feeding the Valley Food Bank. 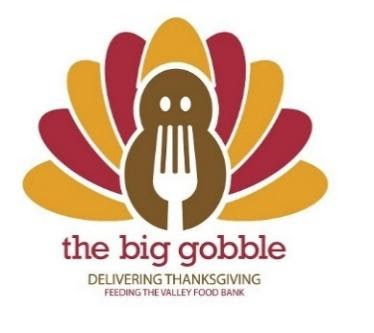 It was such a successful venture, that we brought this event back locally and renamed it the big gobble, Delivering Thanksgiving with our friends from Feeding the Valley Food Bank, 6744 Flat Rock Road, Midland, GA 31820. Still the same mission! We will mobilize hundreds of volunteers to work together to provide and deliver a warm, nutritious meal on Thanksgiving Day to people in need in our community. Thanksgiving is a special day of thanks and giving. This event began in 2008 as an outreach activity by a local restaurant in Uptown Columbus to provide and deliver a traditional Thanksgiving meal to people in need on Thanksgiving Day. Working with community assistance agencies, we delivered more than 1,200 meals to individuals and families in need, and disabled and homebound people in the Columbus community last year. We hope to provide 1,500 meals in 2018. TO WORK IN THE FEEDING THE VALLEY WAREHOUSE. Donate! If you would like to donate to this cause, please donate through this webpage using the Donate tab and add a note indicating that your PayPal donation is for The Big Gobble.